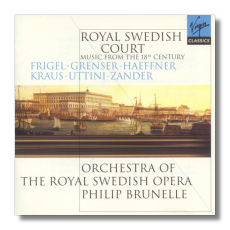 Philip Brunelle and the Orchestra of the Royal Swedish Academy's little anthology of symphonic music from the royal Swedish court between about 1753 (Uttini's symphony) and 1822 (Haeffner's overture). The works range from imports (Uttini was the director of an Italian opera company in Stockholm) to the accomplishments of native sons like Pehr Frigel. With the exception of Uttini, who was born a generation before the others, the composers all belonged to the same generation, yet their styles vary widely, from the gallant Gluck-admirer Uttini through the stormy Grenser to the lyrico-dramatic Haeffner. Although quite a few of the works bear the title "Symphony," there is abundant variety, with bright Italian-opera sinfonias rubbing shoulders with French overtures, darker Germanic works. And one more typical symphony: Zander's relatively extended four-movement work. Finally, the orchestrations also vary, from Uttini's simple setting for strings and horns to the more complex and colorful scoring of Grenser's Sinfonia alla Posta. Besides the obvious connection to Sweden, just about the only constant element in the set is the uniformly excellent performance standard maintained by Brunelle and his orchestra. Given the wide range of works represented, the group's success in providing plausible, informed recreations of each is especially praiseworthy. But the virtues are not exclusively a matter of stylistic penetration. The winds, especially the horns, are startlingly brilliant throughout, and the strings play with a crispness that pays tribute to the articulation and timbres of the historical performance movement. Virgin Classics' recording, exceptionally bright and transparent and with pronounced stereo separation, could awaken the most jaded ear. The names of the composers represented in the collection are not likely to strike a familiar chord, and their works may not rank among the greatest of their era. Yet Brunelle's energetic advocacy, the orchestra's buoyant virtuosity, and the striking recording make for a strong appeal to more than the specialist in Swedish music, or even to admirers of the period's orchestral music in general. Recommended most urgently to those specialists of course, but also to the explorer and the general listener as well.